Destroyed: Fire 5th Century A.D.
Made of: Ivory and gold-plated plates on wooden frame. n ancient times one of the Greeks most mportant festivals, the Olympic Games, was held every four years in honor of the King of their gods, Zeus. Like our modern Olympics, athletes traveled from distant lands, including Asia Minor, Syria, Egypt and Sicily, to compete. The Olympics were first started in 776 B.C. and held at a shrine to Zeus located on the western coast of Greece in a region called Peloponnesus. The games helped to unify the Greek city-states and a sacred truce was declared. Safe passage was given to all traveling to the site, called Olympia, for the season of the games. The site consisted of a stadium - where the competitions were actually done - and a sacred grove, or Altis, where a number of temples were located. The shrine to Zeus here was simple in the early years, but as time went by and the games increased in importance, it became obvious that a new, larger temple, one worthy of the King of the gods, was needed. Between 470 and 460 B.C., construction on a new temple was started. The designer was Libon of Elis and his masterpiece, The Temple of Zeus, was completed in 456 B.C.. This temple followed a design used on many large Grecian temples. It was similar to the Parthenon in Athens and the Temple of Artemis in Ephesus. The temple was built on a raised, rectangular platform. Thirteen large columns supported the roof along the sides and six supported it on each end. A gently-peaked roof topped the building. The triangles, or "pediments," created by the sloped roof at the ends of the building were filled with sculpture. Under the pediments, just above the columns, was more sculpture depicting the twelve labors of Heracles, six on each end of the temple. Though the temple was considered one of the best examples of the Doric design because of its style and the quality of the workmanship, it was decided the temple alone was too simple to be worthy of the King of the gods. To remedy this, a statue was commissioned for the interior. It would be a magnificent statue of Zeus that would become one of the Seven Wonders of the Ancient World. The sculptor chosen for this great task was a man named Phidias. He had already rendered a forty-foot high statue of the goddess Athena for the Parthenon in Athens and had also done much of the sculpture on the exterior of that temple. After his work in Athens was done, Phidias traveled to Olympia around 432 B.C. to start on what was to be considered his best work, the statue of Zeus. On arriving he set up a workshop to the west of the temple. He would take the next 12 years to complete the project. According to accounts, the statue when finished was located at the western end of the temple. It was 22 feet wide and more than 40 feet tall. The figure of Zeus was seated on an elaborate throne. His head nearly grazed the roof. The historian Strabo wrote, "...although the temple itself is very large, the sculptor is criticized for not having appreciated the correct proportions. 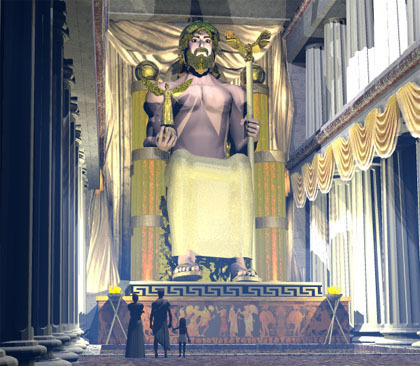 He has depicted Zeus seated, but with the head almost touching the ceiling, so that we have the impression that if Zeus moved to stand up he would unroof the temple..."
Others who viewed that temple disagreed with Strabo and found the proportions very effective in conveying the god's size and power. By filling nearly all the available space, the statue was made to seem even larger than it really was. Philo of Byzantium, who wrote about all of the wonders, was certainly impressed. "Whereas we just wonder at the other six wonders, we kneel in front of this one in reverence, because the execution of the skill is as incredible as the image of Zeus is holy…"
In 97 A.D. another visitor Dio Crysostomos declared the image was so powerful that, "If a man, with a heavy heart from grief and sorrow in life, will stand in front of the statue, he will forget all these." In his right hand the statue held the figure of Nike (the goddess of victory) and in its left was a scepter "inlaid with every kind of metal..." which was topped with an eagle. Perhaps even more impressive than the statue itself was the throne made out of gold, ebony, ivory and inlaid with precious stones. Carved into the chair were figures of Greek gods and mystical animals, including the half man/half lion sphinx. The figure's skin was composed of ivory and the beard, hair and robe of gold. Construction was by a technique known as chryselephantine where gold-plated bronze and ivory sections were attached to a wooden frame. Because the weather in Olympia was so damp, the statue required care so that the humidity would not crack the ivory. It is said that for centuries the decedents of Phidias held the responsibility for this maintenance. To keep it in good shape the statue was constantly treated with olive oil kept in a special reservoir in the floor of the temple that also served as a reflecting pool. Light reflected off the pool from the doorway may also have had the effect of illuminating the statue. The Greek traveler Pausanias recorded that when the statue was finally completed, Pheidias asked Zeus for a sign that the work was to his liking. The god replied by touching the temple with a thunderbolt that did no damage. According to the account a bronze hydria (water vessel) was placed at the spot where the thunderbolt hit the structure. Besides the statue, there was little inside the temple. The Greeks preferred the interior of their shrines to be simple. The feeling it gave was probably very much like the Lincoln Memorial or Jefferson Memorial with their lofty marble columns and single, large statues. However with a height greater than 40 feet, the statue of Zesus was more than twice as tall as Lincoln's likeness at his memorial on the mall in Washington D.C.. Copies of the statue were made, but none survive, though pictures found on coins give researchers clues about its appearance. Despite his magnificent work at Olympia, Phidias ran into trouble when he returned home. He was a close friend with Pericles, who ruled the Athens. Enemies of Pericles, unable to strike at the ruler directly, attacked his friends instead. Phidias was accused of stealing gold meant for the statue of Athena. When that charge failed to stick, they claimed he had carved his image, and that of Pericles into the sculpture found on the Parthenon. This would have been improper in the Greeks' eyes and Phidias was thrown into jail where he died awaiting trial. His masterpiece lived on, however. It was damaged in an earthquake in 170 B.C. and repaired. However, much of its grandeur was probably lost after Emperor Constantine decreed that gold be stripped from all pagan shrines after he converted to Christianity in the early fourth century A.D.. Then in 392 A.D. the Olympics were abolished by Emperor Theodosius I of Rome, a Christian who saw the games as a pagan rite. After that according to the Byzantine historian Georgios Kedrenos, the statue was moved by a wealthy Greek named Lausus to the city of Constantinople where it became part of his private collection of classical art. It is believed that the remains of the statue were destroyed by a fire that swept the city in 475 A.D.. However, other sources say the statue was still at the Olympic Temple when it burned down in 425 A.D.. The first archaeological work on the Olympia site was done by a group of French scientists in 1829. They were able to locate the outlines of the temple and found fragments of the sculpture showing the labors of Heracles. These pieces were shipped to Paris where they are still on display today at the Louvre. The next expedition came from Germany in 1875 worked at Olympia for five summers. Over that period they were able to map out most of the buildings there, discovered more fragments of the temple's sculpture, and located the remains of the pool in the floor that contained the oil for the statue. In the 1950's an excavation uncovered the workshop of Phidias which was discovered beneath an early Christian Church. Archaeologists found sculptor's tools, a pit for casting bronze, clay molds, modeling plaster and even a portion of one of the elephant's tusks which had supplied the ivory for the statue. Many of the clay molds, which had been used to shape the gold plates, bore serial numbers which must have been used to show the place of the plates in the design. A 19th century expedition poses on the jumbled ruins of the Temple of Zeus. Today the stadium at the site has been restored. Little is left of the temple, though, except a few jumbled columns on the ground. Of the statue, which was perhaps the most wonderful work at Olympia, all is now completely gone. 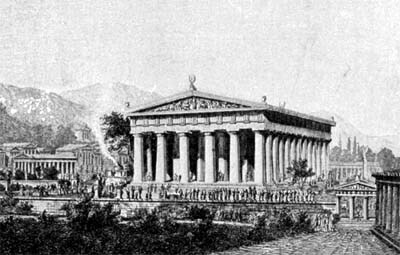 A 1908 artist's conception of the temple at Olympia.